Experienced, local and committed to customer satisfaction. Based in North Stonington CT, Eastern CT Solar LLC specializes in designing and installing residential solar photovoltaic (PV) systems. Installing PV systems since 2006, Charlie Morgan started Eastern CT Solar LLC in 2014 with the desire to continue to bring quality PV services to local communities. 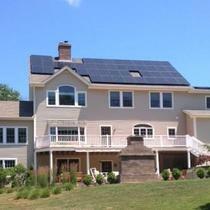 Licensed and NABCEP certified, Eastern CT Solar LLC is an approved CT Green Bank PV installer. Dedicated to the highest quality installations and superior customer service, Eastern CT Solar LLC will take care of all aspects of your project from initial consultation through installation and commissioning of your PV system. "Exceptional Quality & Knowledge Base"
We opted to work with Eastern CT Solar after soliciting quotes online and locally for an ~11kWH ground mount array. Costs were comparable across most quotes, but E. CT quoted the most compact array with the highest quality components - pushing the envelope of what the mount manufacturers had available to try and get the most efficient panels. They were able to answer pointed questions on the spot, demonstrating deep understanding of the field. Quality of the installation is top notch, and they took the time to do the work properly - not a fly-by-night, in and out job. Communication was excellent throughout the process. The ground mount system is incredible robust, and the array has been exceeding expected capacity in the winter months. Minor sink holes near the concrete footings were identified during a mid-winter thaw (installation began right as the ground was beginning to freeze) and they responded to the issue right away. Highly recommend Eastern CT Solar! "Excellent all the way around"
My experience with Eastern Connecticut Solar has been exceptional from start to finish. Charlie answered all of my questions along the way. Installation was of highest quality, so good in fact that the town's inspector asked who had done the work because it was done so beautifully. The system has been performing flawlessly, and if there is ever an unexpected signal from the system Charlie gets in touch and comes out to inspect, if necessary. 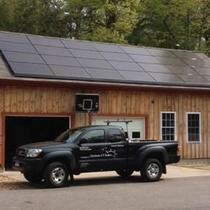 I am extremely satisfied with E. CT Solar and so glad I chose to work with a local businessman. "8.3 KW roof system working great"
We found Eastern CT Solar based on searching for a local installer with good reviews and references, and we were not disappointed! They were professional and not pushy, and guided us through the entire process. I was most impressed that they pulled all the permits with the town, commissioned a local professional engineer to do a strength analysis of our roof, and installed structural bracing in our attic to keep everything sturdy. The system was installed quickly and works great...based on the preliminary performance numbers I think it will outperform the estimates based on the initial solar survey. This isn't suprising because I talked to previous customers who had a similar experience. I will update this review once I get a few weeks of usage data! "Best value. Great to work with. Excellent result." 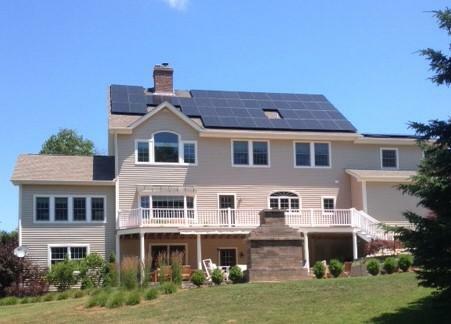 Eastern CT Solar was one of six contractors that we considered for our home solar system. They included a large company, a franchised small business, electricians, and small businesses. 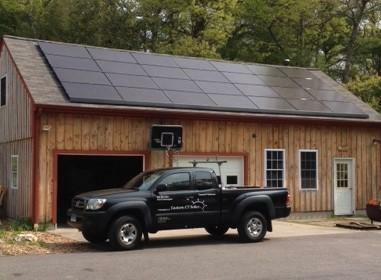 We chose Eastern CT Solar because the owner, Charlie, was very patient and thorough in answering questions about the details of installation and choosing which financing approach to take. We felt that Charlie gave us the best assessment of how details of the installation would be handled and the installation would proceed so that no surprises would come up later. His information was correct. The technology that he sells was, in the opinion of one of his competitors, very good, and the project cost was significantly lower. Once we signed the agreement, the project went forward as planned. 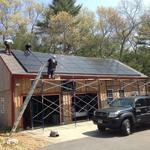 We were impressed with the workmanship by Eastern CT Solar and its electrical subcontractor. They were all very pleasant to deal with. The job was completed with minimal fuss. After the installation, we had a problem with downloading information from the system, which Charlie traced to a Wi-Fi router. Charlie came back to switch to a different router, and the system has operated flawlessly since that time. Our system generated more than 1200 kWh of energy last month. It looks great, and we are very happy that we decided to take advantage of this technology and the financial inducements that are offered. We are looking at a 6-7 year payback on our investment, and gravy after that time. We highly recommend Eastern CT Solar and wish Charlie the best of luck in his endeavor. I chose Eastern CT Solar as the installer for my rooftop system over a number of other good proposals from other fine but much bigger companies, because I liked that with Eastern CT Solar from the beginning I was just dealing with one person, Charlie, the extremely pleasant owner. I do not regret the choice. Always happy and able to answer every question, to respond to every request, and to prioritize our preferences, Charlie completed the job perfectly, quickly, and at a lower cost than the competition. Highly recommended! Let me start out by stating that I install and repair Marine air conditioners.  I need to provide on time service that is of excellent quality. Eastern CT Solar LLC, has educated me regarding solar power. They have installed excellent quality equipment, the workmanship was superb. Eastern CT Solar LLC was a pleasure to work with. To top it all off the production has outpaced my useage for the past two months.